Hybrid power has gained a tremendous amount of momentum in the automotive industry and has even infiltrated the rarified world of Formula One and FIA endurance racing, especially the 24 Hours of Le Mans. 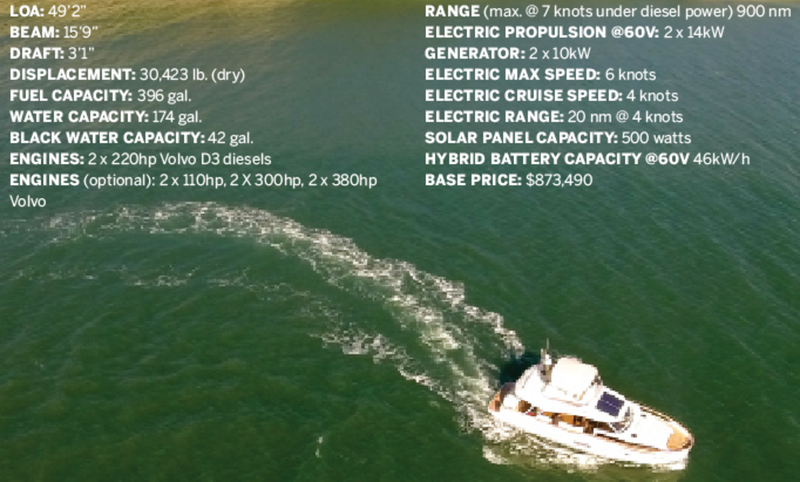 Be that as it may, hybrid power packages as used by the automakers don’t benefit boats in the same way. (See Nigel Calder’s two-part feature “The Science of Hybrid Power,” PassageMaker, March 2014 & April 2014 ). On the other hand, a hybrid package functions beautifully as low-speed and exceptionally quiet propulsion for maneuvering through an anchorage or mooring field, sneaking up on wildlife to get a better photo, and it provides propulsion redundancy. READ: Click here to read part 1 of Nigel Calder&apos;s Science of Hybrid Propulsion from the March issue. 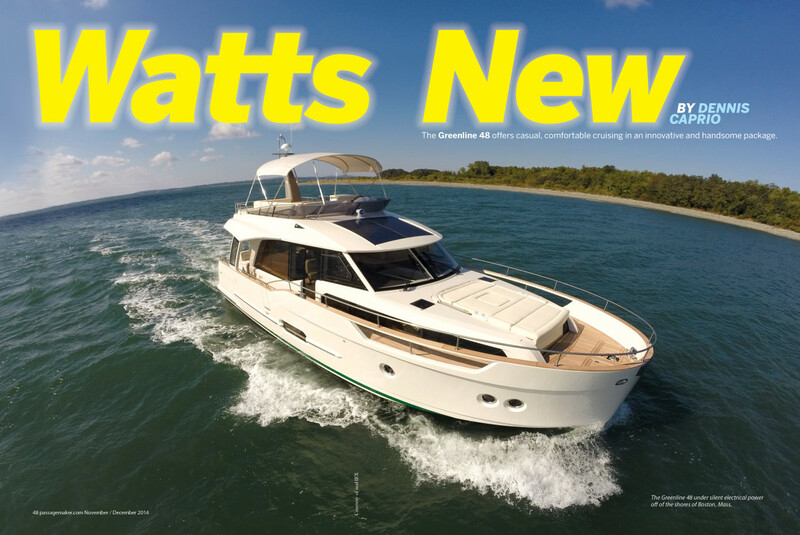 Greenline has put a lot of faith and effort into its hybrid propulsion system, and the introduction of the Greenline 48 at the Newport International Boat Show this past September reinforces the company’s commitment. 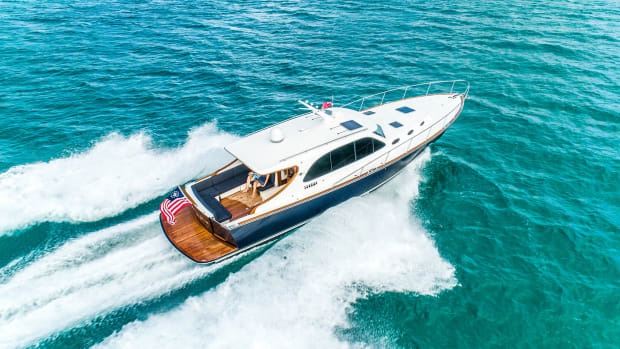 This model bridges the gap between Seaway Yachts’ Greenline fleet (up to 50 feet LOA) and its Ocean Class (up to 88 feet). Designed by J&J Design (brothers Jernej and Japec Jakopin) of Slovenia and built by Seaway in the same country, this newest of the Greenline hybrids is the first to have a flying bridge. Although it limits the area devoted to her solar panels, which help charge the lithium ion batteries, the bridge offers the best view during close-quarters maneuvering, surveying the bottom structure while you look for a path through coral reefs in the Caribbean or for hanging out to watch the sunset. Besides, Americans like flying bridges, so adding one to the Greenline fleet makes good marketing sense. Greenline does an excellent job of blending interior and exterior spaces with tons of windows. In spite of the increase in height the flying bridge creates, the Greenline 48 retains a pleasingly low profile. More important, the low profile reduces the effects of windage at sea or in the harbor. Her lines combine a bit of rakishness with a seagoing purposefulness, two elements that should appeal to a wide variety of mariners. The cutout in the forward section of the sheer line recalls similar motifs aboard superyachts. This, along with the break in the sheer at amidships and the large glazing just beneath it, interrupt the acreage of white fiberglass in the topsides and make the 48 appear longer than she is. Wrapped inside this handsome exterior is a logical and spacious arrangement plan, which features a single-level sole from the transom to the helm. A very large tinted-glass partition separates the saloon from the afterdeck, and it has a bifold door on the portside section. The starboardside panel splits horizontally, the top half swinging up and the bottom half retracting vertically into the cabin sole. The backsplash on the after section of the C-shape galley folds down to form a serving bar that reaches into the cockpit. A bench seat and small table at the transom have room for two to take meals. This layout, like a tailgating party, urges everyone aboard to have a good time. A human-size passageway on the starboard side of the transom leads to the hydraulic swim platform. Wide side decks and substantial bulwarks take all the effort out of moving around the boat’s perimeter, so I suspect the large sun pad on the foredeck will get a lot of use. It’s more than a sunning area, though. The after end tilts up to form a backrest, and a folding soft top shelters loungers who’ve had enough rays. The forward section folds out to form a comfortable bench and, combined with the optional table, creates a cozy cockpit. The flying bridge, too, ought to be popular. The large bracket-shape lounge on the starboard side adjacent to the portside helm and half-acre of sun pad filling the after section of the bridge can accommodate a small village—well, maybe a neighborhood. When you want to add seating opposite the helm, the forward leg of the bracket coverts to a forward-facing bench. A small galley—sink, electric grill and refrigeration—abaft the helm will keep the village fed and watered. The gentle pitch, deep teak reads and robust handrails of the stairway to the bridge promise safe passage, so the bridge ought to be a popular spot at anchor or under way. Windows, windows, windows—these are the secret to a comfortable and enticing saloon. Aboard the Greeline 48, folks can see out when they’re seated at the dinette and lounge. Even though the sole is dark, the light wood of the furniture, off-white fabric and overhead reflect the natural light, instead of absorbing it the way dark colors would. The ambience is casual and elegant at the same time. All of the door and drawer pulls are a neutral shade of leather and are easy to remove and replace. The business ends of the pulls fit into channels and are held in place via stainless steel rods that slip into pockets in the leather. Clever and attractive. 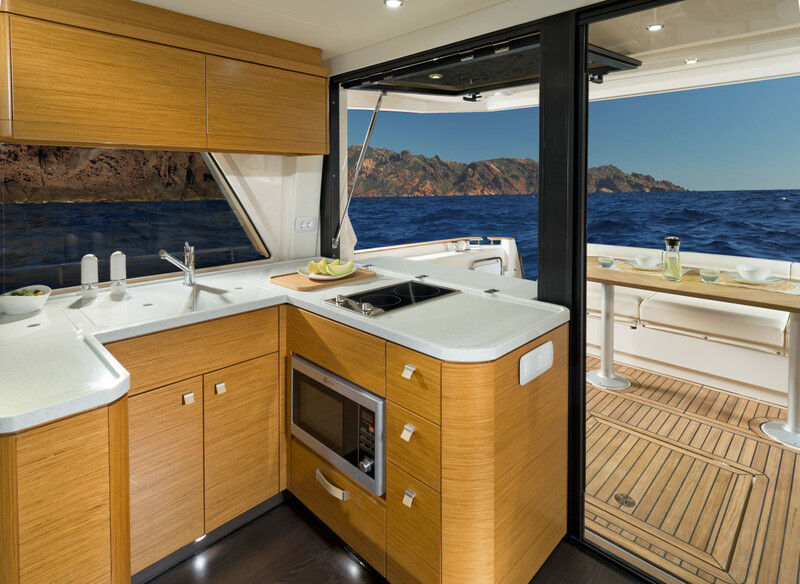 Although the galley has a lot of solid-surface counter space, its two-burner electric cooktop and microwave don’t encourage the preparation of gourmet meals. 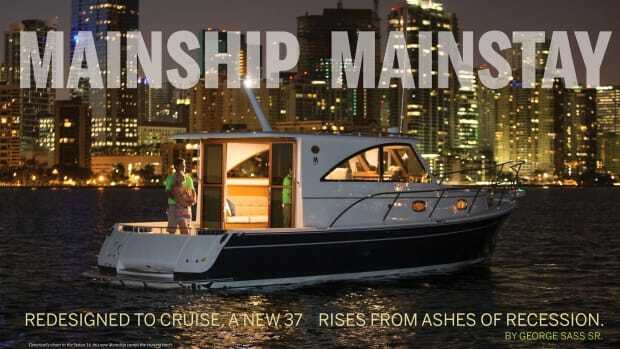 No matter, because Greenline offers a three-burner range and a convection/microwave for dedicated long-range cruisers. A substantial amount of stowage at the galley and opposite it (refrigeration) seemed able to hold everything a cruising couple and children or guests will need between shore-side stops. 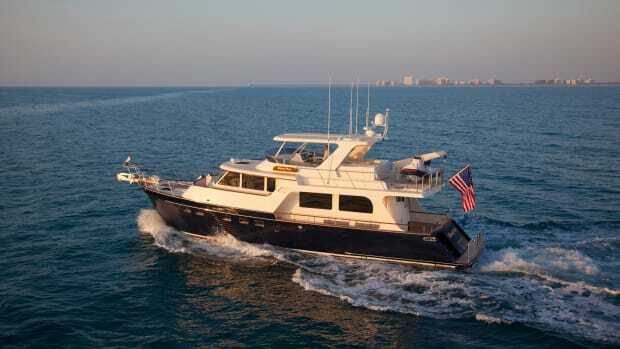 Belowdecks, the Greenline 48’s symmetrical arrangement plan has two mirror-image en-suite guest staterooms amidships. Neither head has a separate shower stall, but both are roomy enough to accommodate full-size humans. Each of these cabins has a single hanging locker, twin berths and a large portlight. Although they are in the depths of the hull, the light neutral tones keep them from feeling the least bit like a cave. The master stateroom in the bow is large, comfortable and fits nicely with the 48’s purpose and character. Two hanging lockers ought to hold an adequate selection of vacationing clothing. The head is on the starboard side against the bulkhead, and the shower stall is opposite. Natural light from windows along the side and across the forward end of the trunk cabin bathe the cabin in natural light. 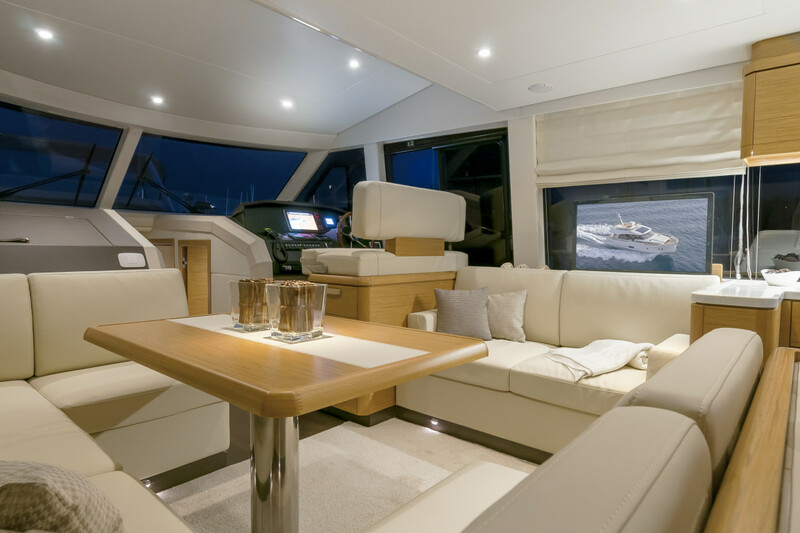 The cutouts in the bulwarks topside enhance the amount of light entering the side windows, and they give occupants of the cabin a good view of the yacht’s surroundings. Greeline offers a fixed double berth on the centerline or a split V-berth that closes to form a double. This clever option lets the master stateroom accommodate two people who don’t really want to sleep cheek by jowl. J&J Design employed its experience with drawing sailing yachts to give each of Greeline’s boats a slippery, seakindly bottom. The company refers to this as a “superdisplacement low-drag hull.” That’s a mouthful, to be sure, but it gets the point across. This bottom has a fine entry, which transitions to a shallow V-shape run. As the run nears the transom, it sweeps up to let the sea break cleanly from the bottom. Her stepped chines, one at the datum waterline and another a foot or so below, repress spray and enhance her lateral stability. Both chines rise as we trace them forward, the upper one terminating within plain site at the bow. 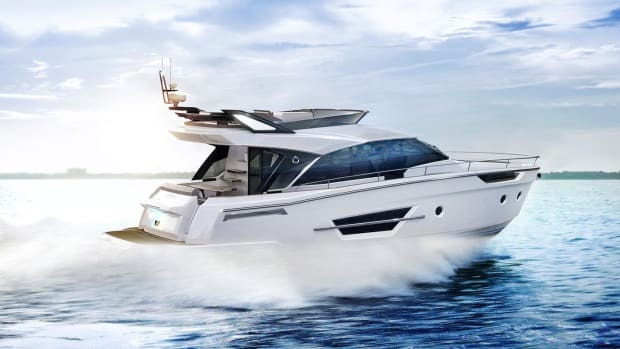 The 48’s lightweight resin-infused laminate and horizontal propeller shafts help the shape get its good fuel economy—900nm at 7 knots under diesel power. 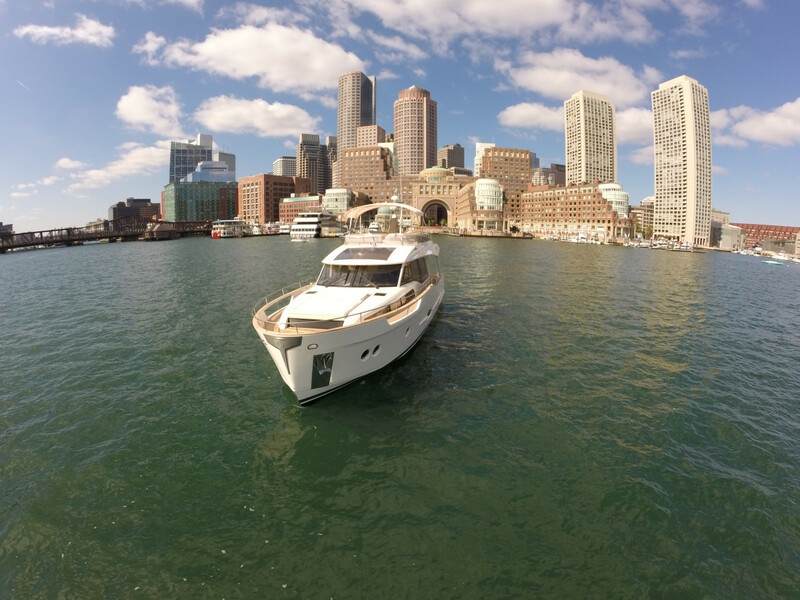 Our test boat, having been hurried from the ship to the Newport show and then hustled to Russo Marine near Boston, needed a few commissioning details to be finished, and one of those was the fuel-consumption monitoring. We couldn’t get gph numbers. As we explored the environs of Boston Harbor, winds of about 15 knots average, played among the many islands of this picturesque and historical area, and we found ourselves in beam seas of more than 2 feet in one place, only to have them on the nose or from an after quarter as we changed course. The 48 rolled predictably, but not violently, in the short, steep beam seas. She steered accurately in following seas and authoritatively plowed her way through the head seas. The most astonishing of her characteristics was the quiet, all the way to maximum speed under diesel power. When we switched to electric, which requires shutting down the diesels and then pushing a button, we could scarcely tell that she was running. Unlike hybrid cars, which automatically engage or disengage the internal combustion engine as the situation demands or enjoy a power boost from running both at the same time, the Greeline’s hybrid has three modes. At the dock, plugging into shore power charges the batteries while the inverters run the 220-volt appliances. In electric-drive mode, the batteries supply all the power to propel the boat. A fully charged battery pack gives her a range of about 20nm, depending on wind, seas, displacement and cleanliness of the bottom. When she’s under diesel power, the engines drive a pair of 10kW generators to quickly recharge the batteries. Additional charging comes from the solar panels on the forward section of the superstructure. The Greenline 48 shows signs of punching above her weight. 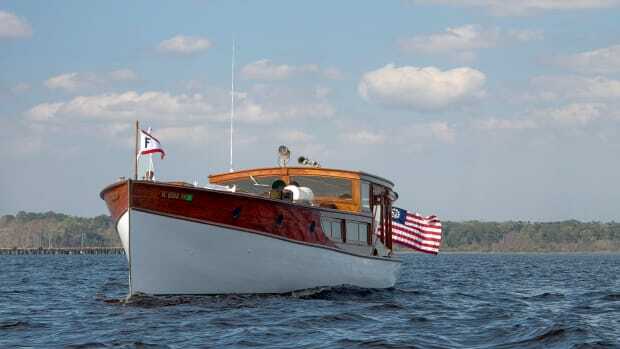 Robust stainless-steel hawes holes and cleats fore and aft seem strong enough for a larger boat. The swim platform has enough square footage to stow a small tender, and buyers can order the optional hydraulic version to ease the launching and retrieving. 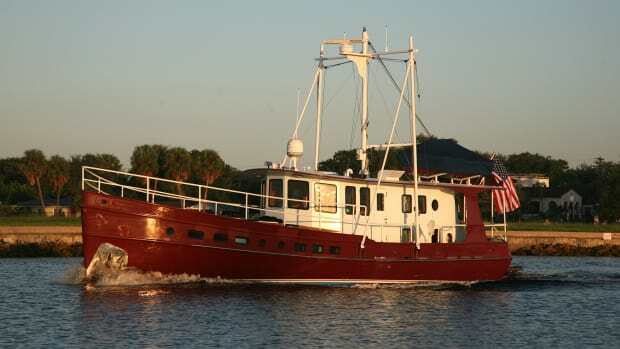 This yacht’s shallow draft, quiet running, and substantial range beg her owner to explore the many nooks and crannies of Chesapeake Bay, the ICW, Florida’s shallow west coast and the Great Loop. 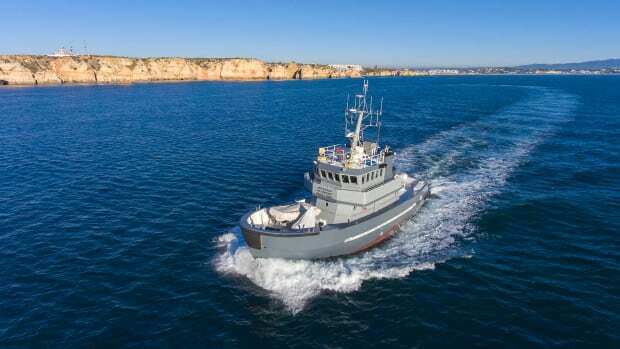 On the other hand, her seakeeping ability urges the owner to venture a bit offshore—maybe to Bermuda, the Bahamas and islands of the Caribbean. She’ll be kind and friendly no matter where she travels. 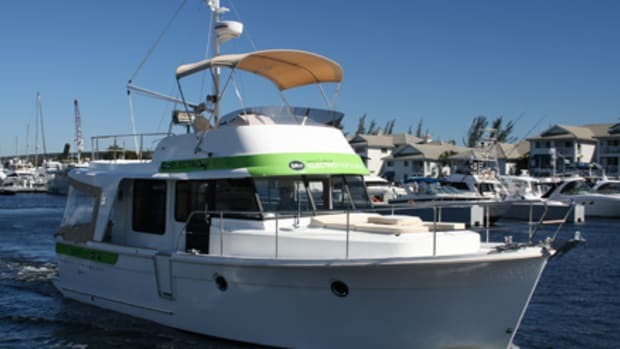 Contact Greenline Yachts, 877-500-1686; or visit www.greenlinehybrid.com.